Two Sundays ago, we had tickets to see the Decemberists at the new Mountain Park here in Holyoke. But after demolition all day, we were barely standing. We gave our tickets to a couple of friends, ate dinner, and fell unconscious. Folks said it was a great show. Why more kitchen demo? Demo was complete, but for moving some plumbing and electric. Since we plan to remove the wall between the kitchen and dining room in a few years to create a really big, warm, modern kitchen that's open to the dining room, we have a small budget for this initial kitchen renovation. We budgeted for the cost and time associated with an Ikea sink cabinet, new electric, a counter top, and some gallons of paint. But in the process of cutting for the new plumbing we found original bead board wainscoting after removing nasty plastic boards and dry wall underneath. 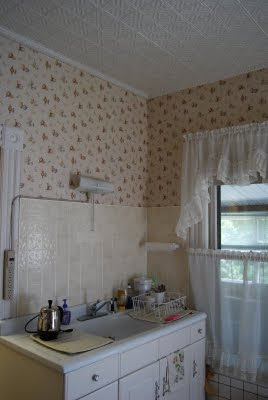 I forgot to take a picture of the raw exposed bead board, but it was just like the bead board in the bathroom. So, we had to decide. 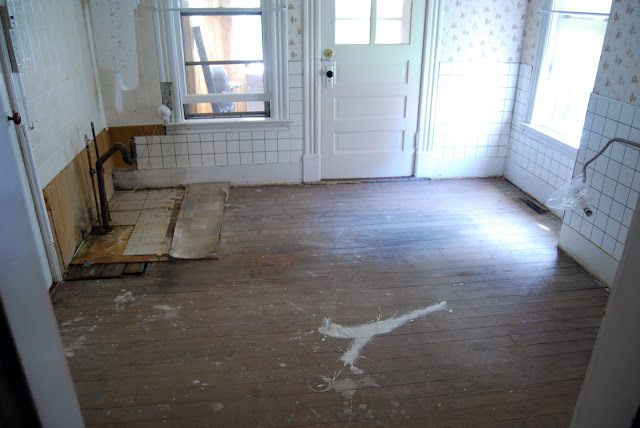 More days of demo to expose ALL the bead board, plus the work of caulking, sanding, priming and painting it? Or forget about the darling original detail hiding under all that crap. Here's the sink area post demo with primed bead board.